Nuts. 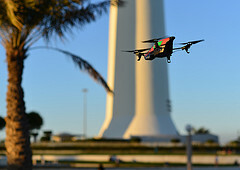 I forgot to point out that photo is another one of the puny micro-drones that cost less than $300 and can be operated remotely by iPhone/Android smartphone. Wonder what they can do to a jet engine if sucked up near a flight path? Wonder what the FAA is doing about that? Drones crop dusting? Certainly not for the squeamish. Think paraquat. For actual crop-dusting (or, more likely, spraying) they aren’t useful. Not enough load capacity. Even the light planes that are used now need more than one load for large fields. I can see drones being useful for checking pipelines in the desert, if they’re carrying a sniffer and a camera with GPS location. Someday we will all have our own personal drones, issued at birth by the government. Most of us will have one crappy little drone that follows us around, taking photographs of us naked, reporting everything we do to the appropriate government agencies and corporations, and taking fees from us. The one-percenters, of course, will have vast fleets of drones, all of them armed. They will have drones that pick us off if we get too close to them. It will be perfectly legal for their drones to mow us down, if we get in the way or eat into the profits. It is a mess. I agree and glad to see you put these issues in such a heartfelt way like any other person would. I’d say that the title of your posts should reflect the “Issue Collage” that it is.